Kā Huru Manu is the highly-anticipated result of the Ngāi Tahu Cultural Mapping Project – a digital atlas that holds over 1000 traditional Māori place names in Te Waipounamu, and their associated histories. The website (www.kahurumanu.co.nz), which launched in November, can be seen as an assertion of Ngāi Tahu rangatiratanga over the rohe, as well as the preservation and sharing of traditional knowledge. Kaituhi Alice Dimond outlines the history of the project, and speaks to some of the many people who contributed to this taonga. Cultural mapping wānanga at Puketeraki Marae. It is hard to pinpoint exactly when Kā Huru Manu began, as kaumātua were collecting much of the cultural knowledge found on the website long before the project was even conceived of. However, all the contributors agree that the launch of Kā Huru Manu is by no means the end. The creation of the atlas, which has been in the works since whānau asked for a digital atlas at the 2012 Ngāi Tahu Cultural Summit, is undoubtedly cause for celebration after years of hard work by a group of committed Ngāi Tahu. Tā Tipene O’Regan spent hours sharing his knowledge and has an obvious passion for the project. When recounting his Kā Huru Manu journey, he shared many accounts of the “migration of tradition”, and the importance of retaining traditional place names so we continue to remember our stories. The website is visually striking, featuring large-scale “cinemagraphs” or “living photos” of some of our most iconic landscapes. The website is divided into five sections: the atlas itself, the Cultural Mapping Story, Our People (biographies of longstanding champions of the project), Kā Ara Tawhito (Traditional Māori Travel Routes) and Acknowledgements. “We wanted to make the website really visual and engaging for our people,” says Takerei Norton (Ngāi Tahu – Ngāti Irakehu, Ngāti Kurī), who has managed the project as part of his work in the Ngāi Tahu Archives Team. “The website includes a mixture of photograph galleries, quotes, interactive maps, and videos. It was also important that it was simple to use – especially for those who are not familiar with GIS technology. “Getting the website completed is definitely a significant achievement. At times it seemed like we wouldn’t get there, but we did; and it will be a great foundation for future generations to work from,” says Takerei. The atlas includes over 1,000 traditional Māori place names, original Māori land allocations, and a selection of traditional travel routes throughout the Ngāi Tahu rohe. The information available on the site was selected and approved by Papatipu Rūnaka, and is only a small portion of the broader data set that has been collected and mapped as part of the Ngāi Tahu Cultural Mapping Project. The bulk of the work was completed over 10 years of wānanga, hui, and field trips held throughout Te Waipounamu. “Initially we had a small paepae of kaumātua who would come into the Ngāi Tahu office at Hereford Street and help us map place names throughout the rohe,” says Takerei. Due to the limited technology at the time, the initial wānanga were laborious. “We had a label machine and large topographic maps. We would type a place name into the label machine, print it off, and stick it on the map. And then of course if we got the name wrong, we had to rip it up and start all over again,” laughs Takerei. This paepae was initially made up of Trevor Howse, Kelly Davis, Matapura Ellison, Jimmy Russell, and David Higgins. When Kelly passed away unexpectedly on the eve of the first mapping hui in March 2007, it became more apparent than ever that there was some urgency needed around the Cultural Mapping Project. “Our paepae started providing their own personal papers for the project. I think this set a precedent for others to follow,” says Takerei. Muriel Johnstone (Kāi Tahu, Ngāti Māmoe, Waitaha) had a huge input into mapping traditional place names in the Ōraka Aparima takiwā. Muriel remembers that when the mapping project started, she spoke to her whānau to ensure they were happy for her to share their materials. 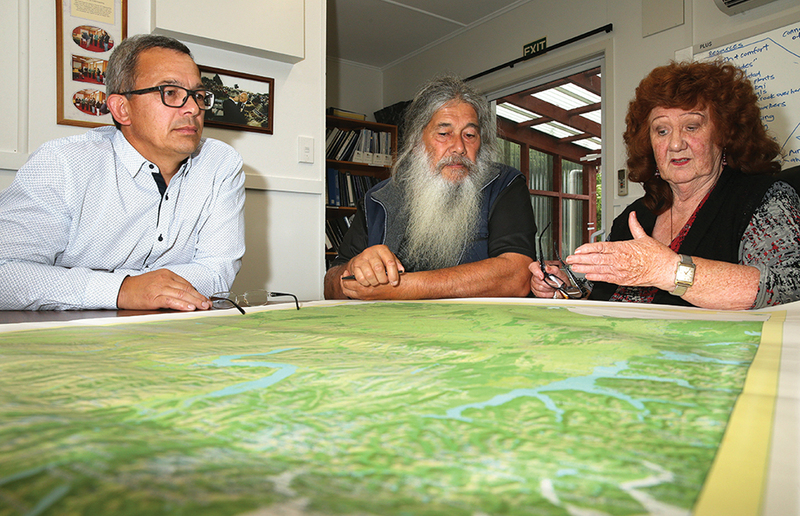 Dean Whaanga (Awarua), Stewart Bull (Ōraka Apirima) and Muriel Johnstone. In addition to input from whānau, much of the information gathered for the project was uncovered through research in archives and libraries around the country, including the Ngāi Tahu Archive. Manuscripts, diaries, maps, and journals were shared and discussed with whānau whose knowledge and experience of their specific tribal areas assisted with the interpretation of this material. With the sharing of knowledge occurring, the wānanga began to expand, and field trips to the sites became a part of the process. Field trips were held over three or four days, and as Takerei recalls, “It was a really low-key whānau approach. We would jump in vehicles, and travel around visiting sites, with people sharing their stories. “One of the real turning points was when Iain Gover came to work for Te Rūnanga o Ngāi Tahu. He changed the way we mapped. We created a Māori place names database that was linked to our mapping programme. This allowed us to map directly into our mapping system on the marae. We could make changes in real time, which greatly quickened the process and accuracy. Mapping on the marae was great, and we were always well looked after wherever we went. We started to create a really cool buzz for the project,” Takerei says. This “buzz” meant that more whānau began to turn up to be a part of the process – some to share their knowledge, and others to listen and learn. The large number of contributors to Kā Huru Manu led to the unique decision to design the acknowledgements section of the website as a collection of photographs, in the hope that no one’s involvement would be overlooked. 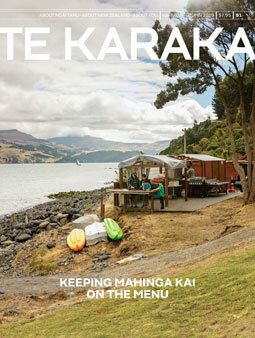 Acknowledgements aside, contributors drew their own rewards from involvement with Kā Huru Manu. Dean Whaanga (Ngāi Tahu, Ngāti Kahungunu, Rongomaiwahine), who made a significant contribution to the mapping of names in Murihiku (Southland), believes the passion everyone had for the project meant they were happy to contribute their time. “Everyone who put their time and effort into this did it because they see it as being very important for all of us. Everyone was really enthusiastic because they love this work just as much as I do.” Amongst all the individuals and whānau who contributed to Kā Huru Manu, there are a handful whose input went above and beyond. When the website was launched last year, eight key champions were acknowledged in the Our People section of the website, with a short biography that introduces them and their mahi. The intention is that this section will grow to acknowledge everyone who has contributed over the years.